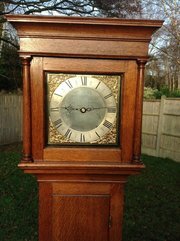 Mid 18th century oak cased 30 hour longcase clock by Phillip Avenell from Farnham, Surrey. Silvered and engraved 10" brass dial, with blued steel hands. Movement strikes the hours on a bell. 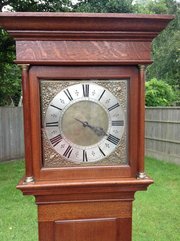 Mahogany cased 30 hour longcase clock by Edward Box from Chichester, Sussex. Pretty 11" square dial with calendar aperture and original blued steel hands. Movement strikes the hours on a bell. Slim mahogany case with long locking front door. Hood has dentil moulding decoration at top. Edward Box was working in East street, Chichester, 1796 till 1803. He was shot dead in a hunting accident in 1803. 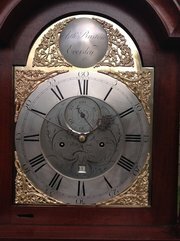 Late 18th century 30 hour longcase clock by probably, William Avenell from Farnham, Surrey. Mahogany case with locking trunk door. Original painted 11" square dial with bird of paradise feature, floral and strawberry corner decoration, subsidiary calendar dial, and blued steel hands. Movement strikes the hours on a bell. Mid 18th century oak cased 30 hour longcase clock by William Avenell from Alresford, Hampshire. Single hand silvered and engraved brass dial with birdcage movement striking the hours on a bell. Original locking trunk door and hood door catch. 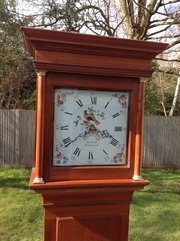 18th century 8 day longcase clock by Arthur Bristow from Eversley Hampshire. Mahogany case with break arch hood and long locking trunk door. 12" brass dial with subsidiary seconds and calendar dials. Hands are of blued steel. Movement strikes the hours on a bell. This clock was supplied to Bristow by probably Philip Avenell from Farnham, Surrey, whose name is scratched onto the rear of the chapter ring and calendar ring. Other "Avenell" features are the seconds and hour hand, and the movement is typically of Avenell high quality. 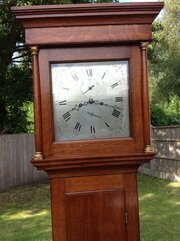 8 day oak cased longcase clock by James Gregory from Basingstoke, Hampshire. 12" square, silvered and engraved brass dial with engraved corners and subsidiary seconds and calendar dials. Matching blued steel hands. Late 18th century, circa 1790, oak cased, 8 day longcase clock by, John Buckley from Canterbury, Kent. Nice coloured oak case with Kent crest to the arched hood top. Wilson dial with strawberrys and carnations in the corners. The makers name is in the arch. Subsidiary seconds and calender dials. Original blued steel hands. Movement strikes the hours on a bell. 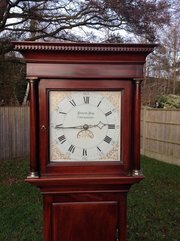 18th century mahogany cased, 8 day longcase clock by Samuel Buxton,from Diss, Norfolk. 12" brass dial with silvered chapter ring, engraved centre, and subsidiary seconds and calendar dials. Matching blued steel hands. With strike/silent facility in arch.